The Fi.ELD is back! 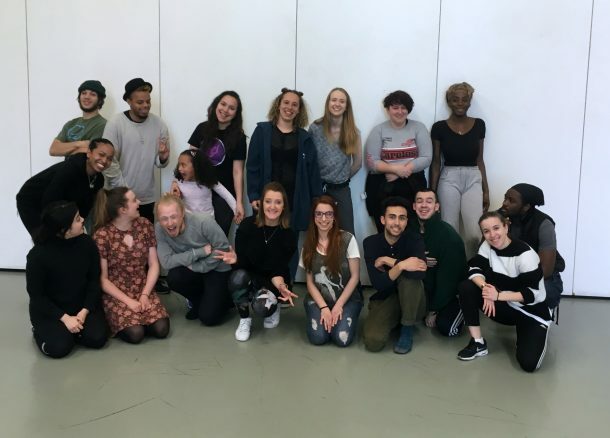 Following a short hiatus The Future Innovators of East London Dance (otherwise known as the Fi.ELD) is back for another 5 year funding round, generously supported by the Esmee Fairbairn Foundation. The Fi.ELD is a unique programme to develop the future innovators of dance, equipping them with skills and resources to make their ideas happen. The Programme is designed and facilitated by a team of top industry professionals: Vicki Igbokwe (Uchenna Dance), Kate Scanlan (Scanner’s Inc) and Kirsty Anderson-Tyrrell (East London Dance). Under their guidance and mentorship, participants have the opportunity to design, develop and deliver their own project ideas with investment from East London Dance. This year’s cohort were selected following a competitive day-long interview process, from which 16 young creatives were selected to take part in this exciting opportunity to advance their careers, and make their ambitions reality. This lucky 16 will embark on a year-long series of talks, workshops, hands-on experience and mentorship, including the opportunity to pitch their own ideas to receive real-life cash investment from East London Dance and stage their own events at The Fi.ELD Festival October 2017. The whole process began on a Residential Weekend, this year hosted by DanceXchange in Birmingham, where the group got to know their fellow Fi.ELD-ers and start to form their plans for the year ahead. Follow The Fi.ELD on Instagram and Twitter to find out more about the exciting events they will be programming for the young people of east London. I have taken dancing lessons since the age of 3 and it is one of the things I enjoy the most as I can express my feelings and emotions. Dancing has helped me cope through a difficult period of my life and I applied to join The Fi.ELD because I now realise that I need to have a career doing what makes me happy. I want to create a business which not only makes me an income but helps young people especially. As a young person myself, it is very daunting to start a business so I will learn a lot from The Fi.ELD. I am also looking forward to making friends and sharing my ideas with them. I’m an emerging artist based in South West London with a passion for choreography, theatre, lighting design and music composition. Sketch Dance Company was set up as the driving force of my creative vision in 2013, allowing me to artistically direct my own repertoire. I’m excited to embark upon this year’s programme of The Fi.ELD, in order to more deeply engage with my interests and skills for my dance company. I believe I will gain valuable experiences with East London Dance and the cohort from this coming year. I’m Sara, 24 years old and I came straight from Italy to follow my nature as a thinker and ‘thoughts-into-things’ maker. I feel amazing to be part of The Fi.ELD because I’ve been looking for years for guidance through the difficult journey of being creative, which is why I decided to apply. Finally, I can now bet that in one year’s time my knowledge, communication & team working skills will be strong enough to keep walking, but this time, with my head up and straight towards the vision I have for myself as a young choreographer, bringing innovation and breaking boundaries. Hi, I’m Georgina and I have previously trained in Ballet, Tap, Jazz and Contemporary. I applied to join The Fi.ELD as I have an interest in producing and choreography as well as performing. After a break from dance, I believe The Fi.ELD will help me in learning how to produce my own events, how to build a presence and to increase my awareness of the industry. My main goal for the future is to create my own company incorporating dance, theatre and visual arts. Hi, my name is Daniela, and I’m a recent graduate from the University of Surrey with a degree in Dance and Culture and I specialise in Contemporary African dance. My vision is to make Contemporary African dance as widely available as any other dance technique and to do so through my own dance company teaching the youth of today. I applied for The Fi.ELD as this programme will supply me with the knowledge and tools to make this vision a reality. I graduated from London Studio Centre in 2016 and since then I have been choreographing with my own company, Limb Dance Co. I am working as a freelance dancer, rehearsal director and teaching assistant with DanceEast CAT. I am really interested in how art can influence the choreographic process and exploring the boundaries of the contexts that dance and art are seen in. I am looking forward to working on The Fi.ELD as I want to discover what is required in producing your own event and then putting this into practice. I started dancing professionally at the age of 17 which at first I was worried about as I thought this was quite late, with a pure passion for dance and desire to enrich my knowledge both physically and mentally within the arts. I am grateful that dance has allowed me the opportunity to travel to a number of places internationally including, Los Angeles, USA, Russia, and throughout the UK. Working with The Fi.ELD I am looking forward to continuing my development as an artist and the opportunity to learn valuable skills within the arts in the modern day. I learnt the foundation styles of Hip Hop such as Bboy, Popping, Locking, Hip Hop Freestyle and Choreo. Over the years I have used all these styles to create and express through my core dance style …Bboying. I joined The Fi.ELD to maximise opportunities in Hip Hop Dance and allow it’s pure essence to shine in communities and cultures around the globe. I’ve always wanted to provide platforms for performers and with that, bring dance to the next stage. I’m eager to gain the skills that will facilitate the effective organisation and delivery of exciting events. My name is Andrei Eduard Maniata. I am a bi-lingual independent individual that wishes to raise awareness of ethnic minorities and sexual minorities as I belong to both these groups. I am self-seeking and able to appreciate an opportunity. I am most looking-forward to creating work with the entire Fi.ELD team due to the diversity & high-potential the group has. I am excited to see how my craft will improve and all the things I will discover about the industry and myself. Hi, I’m Lauren, a Musical Theatre graduate currently living in Mile End. Whilst pursuing my performing career I remember someone telling me that if you can’t find work, create your own work. I’m keen to learn the skills and gain the experience necessary to do this and I’m excited that The Fi.ELD can give me that opportunity. I’m passionate about all things dance and supporting and encouraging our young generation to get our there and make it happen: creating work for themselves and other young performers. Having graduate with a First Class Honours from Purchase Conservatory in New York and London Contemporary Dance School, Ballet and Contemporary dance is what I do. I have dance for people such as James Cousins, Tanztheater Adrain Look, and The London Ballet Company, touring and performing in venues from the V&A Museum to The Limon Festival at The Joyce Theatre, New York. I currently sit on the Board of Directors at DanceEast and I am also a Youth Ambassador at the Southbank Centre. I think we all deserve to be surrounded by Dance and I am excited to work with The Fi.ELD to make this possible. I am the Artistic Director and co-choreographer of What is Written Dance Company and a UK Young Artist Ambassador. I am very excited to be part of The Fi.ELD team this year, to work with like-minded yet diverse team of people to develop new skills and become part of the future vanguard of the industry. I feel truly blessed to be receiving such incredible support and mentoring. I’m a freelance choreographer based in London, and this year I formed my own dance company A.S.DANCE. I’m very excited to be a part of this amazing programme and I can’t wait to connect with other young people working in different fields of the dance industry (pardon the pun!). Hi, I’m Mitchel, and I’m a UK dance artist with a background in art, design and acting. I joined The Fi.ELD to gain more knowledge of the performing arts business, grow my network, and put the skills I have been learning and developing into action. I have been dancing since I was 7 and started to train with various companies and dance groups, as well as performing and teaching in the UK and abroad. I wanted to join The Fi.ELD to give me a better understanding of the business side and for me to develop my own business confidently within the dance industry.